This is Part 2 of a 5-part series exploring the black-white racial empathy gap in the United States. It continues looking at the role of narratives. If you haven’t read Part 1 yet, you’ll want to do that first here. My previous segment ended with the question, If the disparities in police treatment, the criminal justice system, employment, and wages that black men (and women, really) are experiencing can’t be explained solely by individual actions, character, or criminality, then what’s really going on? It also alluded to the need to examine the fate of a centuries-old narrative about inherent black inferiority and criminality. Let’s take a focused tour through some parts of our nation’s history that will hopefully help provide some answers. The myth/narrative of black inferiority was systematically created in the 18th century in order to assuage consciences over and justify the already well-established systems of inequality. It argued that God had made Africans particularly suitable for slavery. Its architects developed belief systems about their natural inferiority based on their unique physical traits. Through such belief systems, the social construct of race was born. Written descriptions of Africans as mean, vile, and untamed savages were widely circulated, creating fear and loathing toward them. In such a climate, slaves were subjected to a comprehensive system of control: harsh labor, cruel discipline, division of their families, and creation of disunity among them by separation into field slaves and more favored house slaves, often through skin tone and facial feature differentiation. [1,2] By the mid-19th century, the idea that there were species-level differences between blacks and whites was firmly ingrained in the public consciousness. And although slavery was legally abolished in 1865, the ideology of difference persisted and was codified into law in the 1890s with the passage of the Jim Crow laws, which officially segregated black people from the white population. 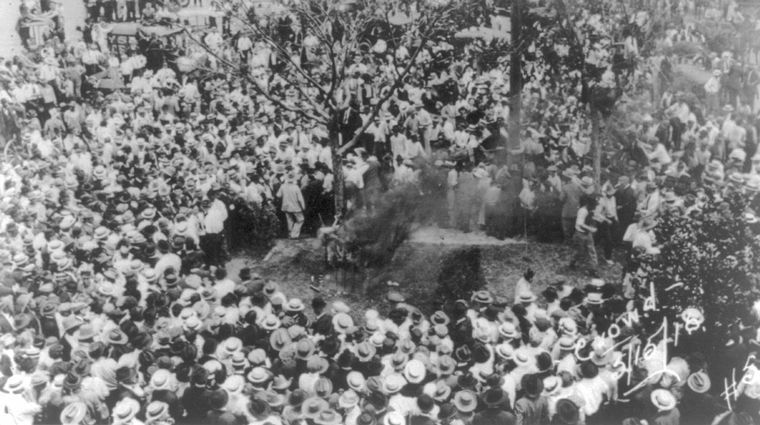 The lynching of teenager Jesse Washington in Waco, Texas on May 15, 1916, attended by 10,000 spectators, including city officials and police. Lynchers castrated him, cut off his fingers, hung him over a bonfire, and repeatedly raised and lowered him for 2 hours. Photos of the event were printed and sold as postcards. His charred remains were dragged through town and parts of his body were sold as souvenirs. Consider the fact that well into the 1960s, the country’s formal posture toward racism as a social institution was one of militant justification, with only isolated pockets of people calling for change on the margins. Racism had not only been legal but had been legally mandated since the 1890s under Jim Crow in the South and similar laws in the North and West (in California, they were referred to as James Crow). From 1890-1965, if white people did anything to promote equality of the races or were caught violating the strict standards of segregation, they could be fined or thrown in prison for up to 6 months. The society itself was structured around obligatory racism. That is the context in which the Civil Rights Movement arose. And if we think in terms of narratives, then we realize that one of its most amazing accomplishments, achieved primarily through its commitment to nonviolent forms of protest in the face of violent opposition, was that it disrupted the centuries-old myth/narrative of biological black inferiority and criminality enough such that the American ethos toward institutional racism began to shift from unconditional and legally mandated embrace toward social and legally mandated rejection. The old narrative about blacks’ being savages that need to be controlled is ultimately one of blatant and unapologetic dehumanization. Once we realize this, we then have a framework for recognizing the ways in which it is still alive and well today, even if the language around it has changed. For example, many who reject the notion of biological inferiority as a means of justification for slavery and racial terrorism would have no problem saying, “He was just a thug,” as a casual justification for an unarmed black man being shot to death by a police officer or a neighborhood watchman. And that’s because if we could put words to the non-verbalized sentiment behind “He was a thug,” the sentence would finish with either, “and therefore his life had no inherent value,” or “so he deserved to die.” It is an echo of the past, only expressed in different language. No doubt that a line of questioning is arising in some of you right now: What about when reality reinforces stereotypes? Aren’t there a lot of black men in prison for committing violent crimes? What about the violent, anti-establishmentarian lyrics in a lot of popular rap music? I will address these things in my next installment. For now, I will say that crime statistics and social pathologies must be properly handled and understood in their full sociological, historical, and even geographical context. Considering them any other way will lead to overly simplistic and mistaken conclusions. Furthermore, they must be separated from the deceptive, pervasive, and false narrative, or myth, of biological inferiority and criminality. What are some of the emotions you’re feeling right now after reading the above? I ask this question because I think it’s absolutely essential for us to be fully present to any toxic emotions around this subject and to tackle them head-on. Do you feel anger, grief, confusion, surprise, irritation, defensiveness, frustration… shame? I actually see a lot of shame surface in discussions about the African American experience, so I’d like to spend some time exploring the dynamics of shame and how it has affected our narratives. Now I don’t know about you, but my personal record of dealing with shame has been a mixed bag. In moments when my shame has been successfully offset by the unconditional love and acceptance of key people in my life, I’ve been empowered to face it and to allow it to nudge me in the direction of positive change and growth. But in moments when shame has made me feel vulnerable, exposed, or defective, or has isolated me from those who normally help me feel grounded and loved, I have fashioned all kinds of fig leaves to cover it up. Some of those fig leaves include doubling down on my defenses, attacking the person(s) causing my shame, and blaming someone I’ve hurt for being too sensitive (because if they’re the problem, then I most certainly am not). In the same way, collective shame about a brutally racist history has produced mixed results over the last 50-60 years. One of the things the Civil Rights Movement managed to do was inject a keen sense of shame into white America’s collective conscience over its institutionalized abuse of African Americans. It marked a significant turning point in the nation’s history. In the beginning, when shame produced an appropriate acknowledgement of injustice and a desire to make things right, it led to cultural shifts and new legislation that effectively released African Americans from the stranglehold of the Jim Crow era. The tricky thing about shame, though, is that it’s a toxic, identity- and value-threatening emotion. and when it’s not processed in a thoroughly redemptive way, it can actually lead to a recycling of our sins instead of a healthy and restorative repentance that moves us toward wholeness, healing, and transformation. Beginning with the generation that grew up on the heels of the Civil Rights Movement, a new ethos of anti-racism began to replace the expiring ethos of racism. While this shift was a good one, it was accompanied by a nagging sense of shame that threatened to indict white Americans as historically bad, immoral people. People were freshly facing the horror that their beloved country, which supposedly stood for freedom and democracy, had used ethnic differences to justify and endorse terrible acts of violence and oppression against an entire people group for hundreds of years. It made them want to rewrite history. So a new shame-based, reactive narrative set in: Forget the past. We are not racists. We are anti-racists. And we are colorblind. This new narrative unwittingly undermined progress even as progress was being made. First, it imposed a willful forgetfulness on one of the nation’s most traumatic and formative experiences – one which desperately required thoughtful, collective, and public debriefing, not consignment to cold storage. Second, it injected taboo-like sensibilities into both the very act of dialoguing about race and ethnicity, as well as into race consciousness itself, which, instead of being helpful, has proven to be very damaging for blacks and other non-whites who wish to have their distinctives recognized, validated, and celebrated alongside those of whites, rather than denied and left unacknowledged. What we really need is the ability to identify and effectively deal with the racist narratives we all inherited, which still exert a powerful, often underestimated influence on the state of things. I say “we,” even though I am Taiwanese-American and my parents didn’t arrive in the United States until the late 1960s, because I am a part of the fabric of this country, and because of that, I have been influenced by the racist narratives here as much as anyone else. Narratives about inherent black inferiority and criminality, the narratives that were once used to justify systems of slavery, racial segregation, and racial violence, are still among us. Just because we now publicly denounce racism, it doesn’t mean that the old narratives have disappeared or that they no longer have profound influence. They have simply evolved, or gone subterranean, and they now exert a subversive influence rather than an overt one. The goal is not and cannot be for white people to take on the shame of yesterday, as if the past could be undone or anything constructive could be accomplished through psychological penance. It is actually far more noble that that. The goal is for whites to take up the courage necessary to face down the shame of yesterday, in order to become a redemptive and truly reconciling force for the future, alongside their black brothers and sisters. Likewise, the ultimate desire is not even for white people to accept blame for the things that white people of yesterday did, but for them to be willing to acknowledge their place along the continuum of history, to see that their “whiteness” is historically connected to the “whiteness” of people who did commit racial atrocities. Because only with appropriate historical memory will they be empowered to write new narratives and respond appropriately in ways that will build a more just society. In part 3, I will discuss further the lingering social pathologies that the nation’s long history of racism has produced, how they reinforce the racial empathy gap, and what may be done about it. Zinn, Howard. “Chapter 2: Drawing the Color Line.” A People’s History of the United States. Leon, Harmon. “8 White People Who Pointed Guns at Police Officers and Managed Not to Get Killed.” Alternet.com. January 12, 2015. Accessed at http://www.alternet.org/civil-liberties/8-white-people-who-pointed-guns-police-officers-and-managed-not-get-killed on March 17, 2015. This is amazing. Thanks for articulating the white dilemma so well. It helps me understand a lot that I didn’t before, about why “racism” is such an emotionally charged term, about why people use the term “white guilt” to dismiss reconciliation dialogue, and so on. I found parts 1 and 2 fascinating. When can we expect the rest of the series? Hard to say, but hopefully part 3 will be out within the next 2 weeks. Thank you for these posts and your continued efforts to bridge this gap. I am grateful for your research, voice, story, and wisdom! Are parts 3-5 available yet? I am eager to read them! Thank you! I’ve been working on part 3 for about 6 months. It’s research-intensive, since it’s a historical piece. I would say it will be close to ready in another couple of weeks.